Standley Feed and Seed is your local hunting supply store. Skip the big box stores and shop locally with us for the top brands of hunting gear and supplies. Find the essential supplies in stock such as deer corn, attractants, tree stands, deer feeders, deer blinds, Purina Antlermax and much more. Start preparing for the season now by picking up your license & taking hunter education classes; clean and repair your equipment; check the lease and property and more. If your equipment has been set aside for some time, take it out and clean it. Check the sight and scope of your rifle. 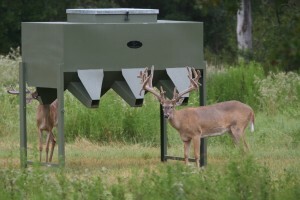 Clean and check your deer feeders and blinds. We stock replacement batteries, charge controllers, solar panels and more. Make sure you don’t show up to hunt with a dead feeder! Stop by one of our Standley Feed locations, your local hunting supply store and stock up on all your favorite hunting gear. Have a question? Our on-site hunters are ready to help you out. Stop by today. This entry was posted on Wednesday, July 18th, 2018 at 2:17 pm	and is filed under News & Updates, Wildlife, Deer. You can follow any responses to this entry through the RSS 2.0 feed. Both comments and pings are currently closed.